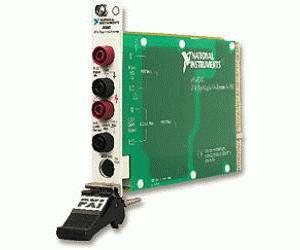 The National Instruments PXI-4060 is a full-featured digital multimeter. It makes accurate 5½-digit measurements of DC voltage and current, true rms AC voltage and current, and resistance (ohms). The NI PXI-4060 multimeter is ideal for use in automating production test, portable field test, and benchtop electronic test. When used with relay scanners, such as the NI PXI-2501, PXI-2503, SCXI-1127, SCXI-1128, or SCXI-1129, you can measure up to thousands of channels consisting of RTDs, thermistors, and current loops.